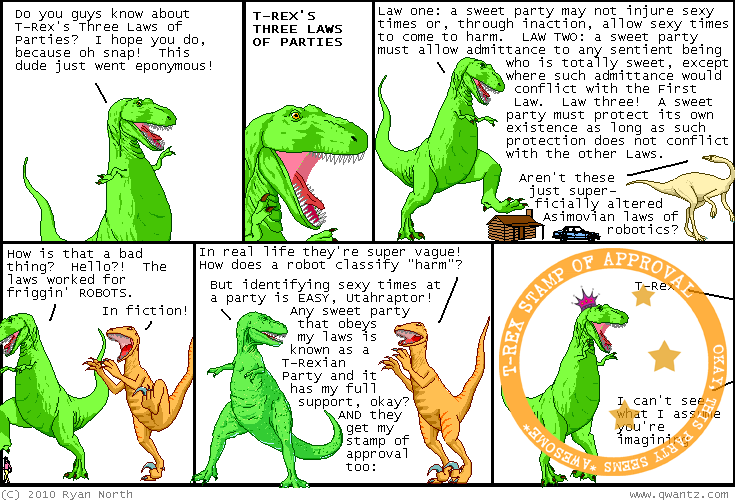 Dinosaur Comics - October 18th, 2010 - awesome fun times! October 18th, 2010: A few folks emailed to let me know that there's some new evidence that suggests T. rex might have been a cannibal, which, you know, is INTERESTING but that same gash could've been made by a dinosaur accidentally biting its own toe OR by some "fooling around" with "toes" and "teeth" that some dinosaurs might've been doing and what I'm saying here is let's not be hasty; let's not go throwing around "labels" based on "dietary eccentricities". UPDATE: Skid wrote in to let me know this is how robots classify harm: punchin' dudes. One year ago today: writing comics like this is a bad idea because if i DO get murdered, i can just see the defense for the murderer in court saying "your honour, this apparently dead guy wrote comics about faking your own death; TOTALLY JUST THROWING THAT OUT THERE"